Functional Records, which started from the Beatz & Bobz night in the South West of the UK has progressed into one of the premiere breaks labels in the industry. They will celebrate their nine years in the scene by dropping a compilation album which will showcase some classic hits interwoven with the latest. 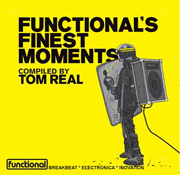 The twelve track CD was compiled by Tom Real who has been spinnin' Drum n' Bass/Breaks for over a decade. "Functional's Finest Moments" will be released on June 18th.